Today Jen went to the doctor. Sorry, I don't know why I brought that up. She goes to the doctor every day. Today, however, they seemed to have relaxed a bit. Maybe it's because she's in her thirty-sixth week. Maybe it's because they've given up on trying to diagnose her with one of several pregnancy-related maladies. At any rate, we took another day to be really excited about the upcoming births but enjoying every last moment of relative peace we will enjoy for the next eighteen years or so. With temperatures approaching 100 tomorrow we took advantage of the modest 90 degree temperature this evening to eat outside once again. 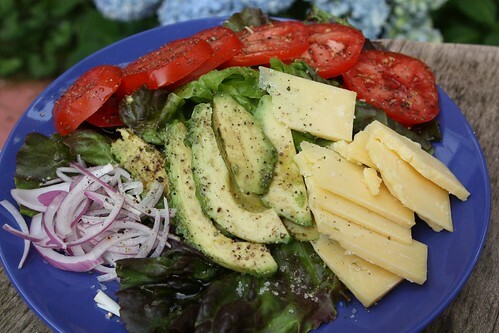 I started by making this "salad" with green leaf lettuce, avocado, red onion, tomato, and Borough Market cheddar. However, this was a salad in disguise! This salad did double duty as a toppings plate for grilled elk burgers! I was fortunate enough to find some nice ground elk meat at the green market from Rosebrook Elk Farm in Roseboom, NY. I couldn't resist the lure of some fresh elk meat so I made the quick purchase, grilled it up, and served it on a toasted brioche roll from Hot Bread Kitchen. 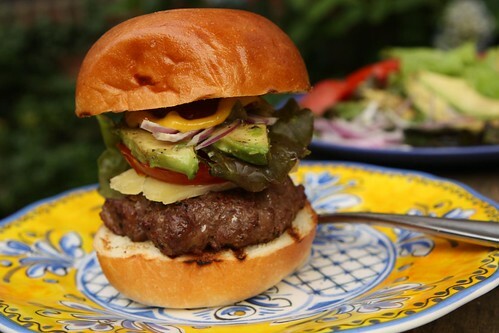 I could have fooled anyone into believing it was a normal beef burger because it also had lettuce, tomato, avocado, ketchup, mustard, relish, and red onion. Kind of a waste of some nice elk meat actually. Still, very delicious. Jen gets a little finicky about exotic meats so I made some plain beef burgers for her. Lately I have just wanted to eat all kinds of exotic animals. I have actually wished I could eat whale and oryx late. This makes Jen upset and it actually upsets me a little too. Not because I want to eat exotic animals but more so because of the lack of any sort of guilt I probably should feel at wanting to do this. For beer I had a late July 4th themed beer, this Independence Day 2012 from Innis & Gunn. I was a little surprised to find that the only Independence Day themed beer I've ever come across is actually brewed in Scotland. This was much different than I'd expected. It tasted much lighter than expected. 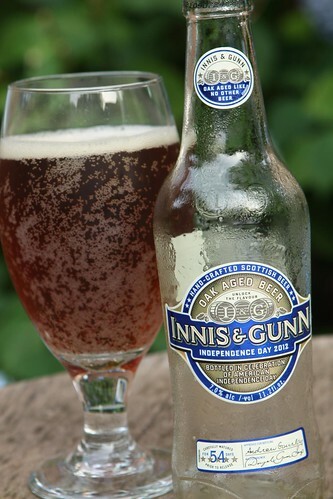 It was more like a light import lager (with a slight skunkiness likely due to its clear bottle) than like other Innis & Gunn offerings I've had in the past. That being said it was probably on par with the gw Beer I had on the 4th, just a bit darker and oakier. George Washington would probably be very happy we had his small beer on July 4th while reserving the Scottish attempt for later in the future. George Washington would also support my eating of exotic game. The only thing that could have made tonight's elk dinner any better would have been eating it with wooden teeth.